More and more people are swimming without getting their hair wet. In our local pool there is not a swim cap in sight, instead back and forward they go with their immaculately coiffed heads held at an awkward angle out of the water. As I pounded up and down the pool this morning it struck me that one of the problems with classical music today is that concert, broadcast and recording schedules are devised for audiences who want to swim without getting their hair wet. Many years ago when I was learning to sea kayak off the Cornish coast one of the first things the instructor did was to tip us out of our canoes, and the CD seen above is the musical equivalent of those involuntary duckings in the Fowey estuary. The Schola Gregoriana Pragensis made an appearance here some time ago when they released a disc on which plainsong met Tibetan Buddhist chants. 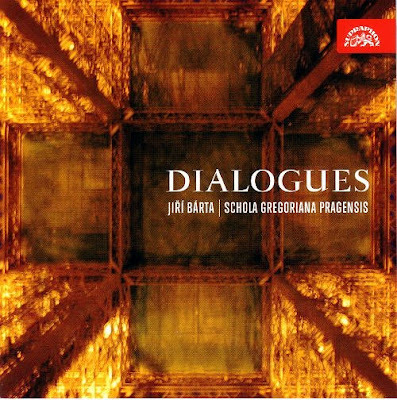 Their new CD Dialogues continues the meetings theme but this time early music meets new music from the Czech Republic. In the opening sequence of Gregorian chant the voices of the Schola Gregoriana Pragensis are joined by the solo cello of Jiří Bárta. Then the Suite for Solo Cello by Peter Graham (b.1952) and In the Gorge for Solo Cello by Martin Smolka (b. 1959) frame a central sequence of the Misere of Pawel Szymanski (b. 1954) scored for male voices, vibraphone, harp and four cellos followed by more Gregorian Chant and an arrangement by Jiří Bárta for four male voices and two cellos of Arvo Pärt's Fratres. Audio samples of all works can be heard on the Supraphon website. Forget the well-meaning but predictable Dialogues title and savour the bracing music and bracing performances. Thoroughly recommended for those who don't mind getting their hair wet. Ben did it, so why shouldn't I? * As a link between the recent themes of transmission and total immersion try Waterlog by the late Roger Deakin. This book celebrates the author's love of swimming away from the confines of a swimming pool. Which is also what this post is about. Intriguing. I vividly remember Bárta butchering Fratres live last year at the International Music Festival Kutná Hora so witnessing him make another go for it is a little scary. He seems to be the type of guy who overloads with assignments and actually prides himself in pulling it off, whatever the collateral damage might be. His performance made me appreciate the piece more, though. Through the highly imperfect playing, I've understood the perfection of the music itself like never before. Walden, thanks for that comment which perfectly captures what I was trying to get over in the post - a love of swimming away from the safety of a swimming pool. Particularly nice to see a comment coming from the Czech Republic. A piece of peripherally related trivia: the very well-used car that is literally the driving force of so many of these posts is a product of that country.